Whoever penned the old adage "a watched pot never boils" surely never tried to heat up water in a pot lined with copper nanorods. "Like so many other nanotechnology and nanomaterials breakthroughs, our discovery was completely unexpected," said Nikhil A. Koratkar, associate professor in the Department of Mechanical, Aerospace, and Nuclear Engineering at Rensselaer, who led the project. 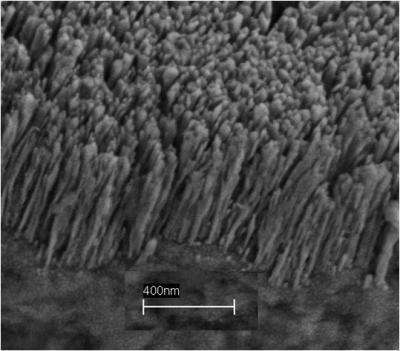 "The increased boiling efficiency seems to be the result of an interesting interplay between the nanoscale and microscale surfaces of the treated metal. The potential applications for this discovery are vast and exciting, and we're eager to continue our investigations into this phenomenon." "By themselves, the nanoscale and microscale textures are not able to facilitate good boiling, as the nanoscale pockets are simply too small and the microscale cavities are quickly flooded by water and therefore single-use," Koratkar said. "But working together, the multiscale effect allows for significantly improved boiling. We observed a 30-fold increase in active bubble nucleation site density — a fancy term for the number of bubbles created — on the surface treated with copper nanotubes, over the nontreated surface." "If you can boil water using 30 times less energy, that's 30 times less energy you have to pay for," he said. The team's discovery could also revolutionize the process of cooling computer chips. As the physical size of chips has shrunk significantly over the past two decades, it has become increasingly critical to develop ways to cool hot spots and transfer lingering heat away from the chip. This challenge has grown more prevalent in recent years, and threatens to bottleneck the semiconductor industry's ability to develop smaller and more powerful chips. "Since computer interconnects are already made of copper, it should be easy and inexpensive to treat those components with a layer of copper nanorods," Koratkar said, noting that his group plans to further pursue this possibility. >"Like so many other nanotechnology and nanomaterials breakthroughs, our discovery was completely unexpected..."
Only to complete ignorants. Molecular sieves and other highly porous materials has been used for precisely the same purpose for centuries. And no it wont revolutionize the process of cooling computer chips cause no one wants to have boiling pressurized water in their computer, especially when normal single phase water cooling is more then enough. >"If you can boil water using 30 times less energy, that's 30 times less energy you have to pay for,"
2. The energy needed for boiling (= final phase transition) of water is marginal comparable to the energy needed to heat the water to boiling temperature. And to think that this nano charlatan is an "associate professor in the Department of Mechanical, Aerospace, and Nuclear Engineering at Rensselaer"! Either he is SEVERELY misquoted or he is suffering from dementia and should be promptly fired. superhuman, I've found no reference to molecular sieves being used to reduce the energy needed to bring liquids to the boil. Please provide some evidence for this claim. Your point about the energy factor is quite valid but all scientists and academics are guilty of shameless self promotion, its human nature. You ought to chill out man. A common molecular sieve material - zeolite is even named after that effect. "Zeolites (Greek, zein, "to boil"; lithos, "a stone") are hydrated aluminosilicate minerals and have a micro-porous structure. The term was originally coined in the 18th century by a Swedish mineralogist named Axel Fredrik Cronstedt who observed, upon rapidly heating a natural mineral, that the stones began to dance about as the water evaporated. Using the Greek words which mean "stone that boils," he called this material zeolite." The dancing is due to rapid bubble nucleation on the highly porous surface of zeolite. What pisses me off is that the role of science is to educate people and this site is doing exactly the opposite - it spreads misinformation and lies. By publishing such nonsense stories this supposedly pro-scientific site gives science a very bad reputation which is in my opinion undeserved. And there have been boiling stone chips added to nucleate boiling in test tubes, they give off a stream on bubbles, rather than having the whole lot get pushed out by one huge expanding bubble when the water is overheated.